FiveThirtyEight reports that the progressive blog Daily Kos is suing its former pollster, Research 2000, for fraud. Analyses of the Research 2000 data have uncovered patterns that are statistically extremely unlikely to occur. 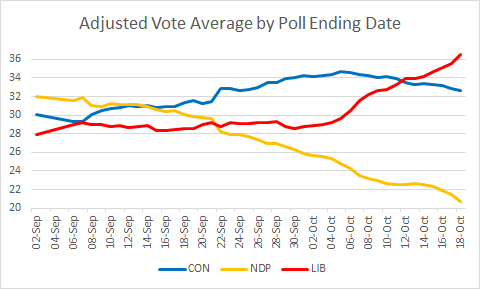 It doesn't look like any of the major Canadian pollsters are up to such shenanigans: while some of them have recurring biases (e.g. Nanos often favouring the Liberals and Ipsos often favouring the Tories, though both less so recently), it doesn't look like any of them is doctoring results in order to fake consistency. Biases are expected to arise from honest differences in methodology. You may notice that EKOS poll results are remarkably consistent from week to week, but that is due to their big sample sizes: their day-to-day results are actually very erratic, as one would expect. Late forties, fifties, sixties: Post-war boom due to pent-up demand (forced saving during the war), rebuilding in Europe. Artificially extended into the 60s by overly lax monetary policy. Seventies, early eighties: Instability due to inflation - it's a hangover from the 60s' overheating - compounded by the oil shock. Would have been much more painful if it weren't for favourable demographic circumstances (baby boomers trickling into the labor market). Mid and late eighties, nineties, naughties: Boom due to favourable demographics (baby boomers form a large experienced workforce) and a large technological shock. Moderated in Canada by sky-high federal deficits, which hurt investment. Artificially extended into the 00s by debt run-up. So what happens now? Just like during 1970-1983, we'll have to mop up a mess. Except this time, it's not inflation, but debt. The issue is different, so the policies will differ as well, but the big picture is the same: we've front-loaded growth in the past decade, and now's the time to pay for it. On the plus side, we won't necessarily have to endure a crisis like the Oil Shock to make things worse. But the minus side dominates: rather than favourable demographics, we'll have terrible ones, as baby boomers start retiring. - 3% growth will not be standard anymore: the new normal will be closer to 2%. (To be sure, during the recovery, we may grow for a while at 3% or more, but it won't be sustained.) In Europe, it may be 1-1.5%. - Health care costs will keep exploding for a decade or so, but will eventually slow. This is because eventually, governments around the world will not be able to afford year after year the slew of new expensive treatments we now invent annually. Health care innovation will therefore slow due to lack of demand, or at least partly shift from seeking to prolong life to seeking to cut costs. So while the current catastrophic long-term cost projections won't come true, neither will the long-term life expectancy projections. 3. Crisis point is reached, and these benefits are abruptly reduced, causing much pain to those that didn't see it coming. - Unless we end up like Japan, real interest rates will rise sharply at some point: in the next 20 years, a lot more people will be running down their retirement savings in the West. Moreover, in China, the coming generation of workers at the top of their earning potential will save less due to cultural change, and the Central Bank will (very gradually) let its currency rise and stop buying foreign assets as quickly as now. As that happens, stocks will do poorly, until interest rates stabilize at their new, higher level. At that point, stocks should turn up, but that might be too late for some. - Once interest rates rise (or if we end up like Japan), investment, and therefore innovation will slow. That 2% growth norm may endure even after we finish mopping up this debt mess. - There will be another bubble, but it won't be as big because there will be less easy money floating around. - Some governments will be tempted to inflate their (and their citizens') debt away. Those that do so modestly may get away with it. Those that are too overt about it may lose control over inflation, though the countries most at risk of doing that are in the Eurozone, so they can't do it. The U.S. has some leeway due to its reserve currency status, and if inflation returns while unemployment stays high, the Fed will likely let inflation rise to 3-4% (instead of 2-3% as it has done over the past 20 years). - The U.S. will have persistent high unemployment, a slow recovery that won't feel like one, followed by slow growth that will feel like a prolonged recession. - Canada's growth will also be slow, but a bit less so than America's, and the gap in GDP per capita may diminish. - Québec leaders will try some timid reforms, encounter disproportionate public protests, and back down some of the time. - French leaders will try some ridiculously timid reforms, encounter completely disproportionate public protests, and back down most of the time. - Italy, Greece and Portugal will stagnate. - The British Isles will stagnate for a few years, but then slow growth will resume. - It's a crapshoot whether Spain will look like Italy or the UK. - Germany shouldn't stagnate, but might anyway due to their obsession with austerity. - Japan will have a third lost decade. - Korea, Taiwan, Hong Kong and Singapore will keep growing smartly (if a bit slower than before). By the end of the decade, HK and Singapore will be richer than the US (on a per capita basis - some say Singapore already is), while Korea and Taiwan will be richer than Western Europe for the first time since at least the Middle Ages. - Australia will also keep growing at a healthy clip, and will become richer than Canada. - China's growth will slow. It will also still be among the fastest in the world. China's trade balance will narrow, the yuan will very slowly appreciate, and in 10 years, the phrase "Chinese consumers" will often be heard in Western newscasts. 1. Numbers posted after today are not directly comparable to numbers posted previously. 2. To approximate a fair comparison, you would multiply the previous numbers by 1.04. For example, the gap in the latest projection was 5.7% under the old method, and is 5.9% (approximately 1.04*5.7%) under the new one. I don't routinely post poll averages because I don't feel they bring much value added to this blog: you can get very similar numbers from other sources (unlike seat projections, there isn't much variation other than resulting from the time frame considered), or easily compute them yourselves. But for what it's worth, I currently have: CON 34.5, LIB 28.6, NDP 16.7, BQ 10.3, GRN 8.6. Update (April 23, 2011): I should have said a little more about what this change is about. Basically, in past elections, the NDP, Bloc and Greens received fewer votes than suggested by polls. Most of these sometimes went to the Liberals (2004, 2006), and sometimes went to the Tories (2008). What I started doing after this post was to slightly reduce the small parties' numbers (by 0.5-1 percentage points in most cases) and to proportionally distribute those votes to the Grits and Tories before projecting seats. For the fourth week in a row, the EKOS poll shows a shrinking Conservative lead. This time, both main parties gained support, but the Liberals a little more. In Ontario, the latter still hold a 3-point lead, in contrast to the recent Harris-Decima poll. However, EKOS agrees that the Tories have taken a slight initiative in the Atlantic. The weirdest result in this poll is a Liberal lead in BC: 2 ahead of the Conservatives, and 6.8 ahead of the NDP. This is probably a statistical blip, and in any case doesn't affect the seat projection since they Liberals were too far out to begin with. Compared with the 2008 election results (and counting Conservative-minded independents as Tories) gives: CON -12, LIB +2, BQ +6, NDP +4. Clearly, both main parties are far from a position where they'd want an election. The average Conservative national lead is 5.7%. Canadians want courageous politicians that lead us toward our goals. Or do we? 2. We want to maintain our system of public universal health care. Since health care innovation and population aging push medical costs up faster than nominal economic growth, over time, a greater portion of our income will have to go toward health care. Thus, even if our governments cut other spending, it will be difficult to cut spending overall. Combine 1 and 2, and it's clear that our governments need to find a way to raise taxes without choking the economy. Apart from Pigovian taxes (taxes on activities that hurt bystanders - we'll come back to that in a second), consumption taxes are widely considered by economists to make less damage per dollar raised than taxes on other things (e.g. wages, investment income, profit, trade). And among consumption taxes, designs that treat all sectors of the economy equitably (i.e. that do not tax certain goods twice and exempt others) cause less harm. 3. We want to leave a decent environment to future generations. If the scientific consensus is correct, this will involve drastically cutting our carbon emissions. Although Canada doing so on its own is unlikely to make a difference, if we find a way to aggressively cut our emissions, we may inspire other countries to do so. After all, if small European countries had not already taken action, the large ones would likely be farther away from doing so, and the U.S. might not even be talking about it! The problem with carbon emissions is, of course, that if polluters and their clients gain from a transaction, they will engage in it even if everyone else loses. If the loss outweighs the gain, that's a bad thing for overall welfare. The solution is clear: incorporate the costs borne by others into the transaction, and then, automatically, only transactions where gains outweigh losses will occur. The two solutions that I'm referring to above are, of course, value-added taxes (i.e. GST/HST) and carbon taxes. We all know what happens to politicians that enact/increase those levies. Why? Surely, we Canadians are not sabotaging ourselves willfully. We should also be smart enough to understand what's going on: we do have one of the world's best elementary and secondary school systems, and some other countries (mainly small ones in Northern Europe) did get it. Maybe we're so smart we found something better? If that's true, I must be out of the loop. No, most Canadians simply do not get what's going on. Why? 1. Too many Canadians are lazy with regards to their civic duty. Canadians are also very cynical about politics. But cynicism can be a good thing - pushing people to think critically about what the politicians are saying. Unfortunately, that cynicism is coupled with laziness. Result: "I don't trust that politician AND I'll too lazy to find out if what he says is right. So I'm just going to go with my gut feeling." Of course, other than spoiled food and serious emotional distress, taxes rank right up there in things that don't sit well with the gut. 2. Our media are lazy. You want to read a serious article about the costs and benefits of consumption and carbon taxes? Good luck. Either you will not find anything more than 5 paragraphs long, or you will find a seemingly deep article until you realize that 90% of the sources are either unqualified or have a stake in the issue. On the HST debate, the CBC's approach was to mostly invite politicians and their staff, people affiliated with organizations/think tanks aligned with political parties, or, in one occasion, a "marketing expert" (who, from the looks of it, may have failed Econ 101) to analyze the likely effects of harmonization. Neutral economists? "Nah! They're kind of boring, don't come to us, and may take multiple calls or emails to get a hold of. So why bother?" And of course, the pundits spend 5 times more time talking about how complex the policies are and what the political ramifications might be than it takes to actually break down and explain the main pros and cons. What's going on in Ottawa now? Probably at least two thirds of our politicians (and certainly all the leaders) know that raising the GST and/or instituting a carbon tax would benefit the country by reducing the deficit, creating room to cut other taxes and/or raising money for government programs at relatively low cost. Not a single one of them is going to champion these ideas anytime soon, and all will pounce on anyone that might be foolish enough to do so. The latest Harris-Decima poll gives the Tories a 7-point lead nationally, but an 8-point lead in Ontario. They are also neck-and-neck with the Liberals in the Atlantic. As for Québec, the Bloc got another huge number: 45%. In BC, the Tories and the NDP are leaving the Grits in the dust. So, in short, no good news for the Liberals. 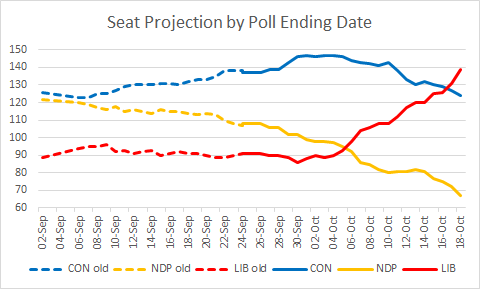 The Tories can get some hope in Ontario (the previous EKOS and Ipsos polls both showed a Liberal lead there), but really need to worry about the NDP in BC. The Bloc and the NDP are again simultaneously at their highest projected seat count in a year. The Conservative average national lead is 6.1%. You may have noticed that the layout of the blog changed drastically. That's because Blogger started requiring the use of titles for their text gadgets, at least for the template that I was using. Unfortunately, the use of that feature made the blog quite ugly - so I decided to go for a whole new look; I hope that you enjoy it as much as I do! I will keep updating the background colour to reflect the latest projection, even though those changes have not been noticeable lately. Regionally, this poll is interesting. First, it shows a 4% Liberal lead in Ontario, confirming both the EKOS poll from last week and the Ipsos poll from the weekend. In my poll average, the Grits and Tories are tied in Ontario; if future polls further corroborate the latest numbers and the Grits move to a 4-5% lead, they would pick up about 5 seats from the Tories. Second, the Bloc busts (oy) everyone else in Québec with a 21.6% lead over their closest rivals, the Liberals. Further proof that voters are disenchanted with federal politics. The final interesting result from the poll is the tie in BC between the Tories and the NDP. This highly contrasts with the recent Ipsos poll, which showed a 26% Conservative lead. The truth almost certainly lies somewhere in between. However, the Grits do get closer to more pickups in Ontario. The Tory average national lead has now dropped to 6.0%. ThreeHundredEight.com has posted the regional breakdown of an Ipsos Reid poll released last weekend. As usual, relative to other pollsters, Ipsos has the Tories very strong out West, and the Bloc very strong in Québec. The interesting numbers are in Atlantic Canada, where the Tories lead by 17, and in Ontario, where the Grits lead by 5. Adding this poll to the projection mix causes a seat swap between the two main parties. Moreover, Léger Marketing has conducted a Québec poll. No big surprises there, though there were slight drops for the Tories and Dippers, and slight increases for the Grits and Bloquistes. 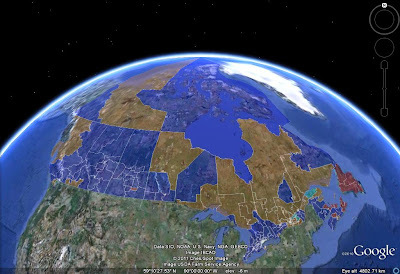 This poll does not change the Québec projection. The average national lead by the Tories is now 6.4%. For the second week in a row, the EKOS poll detects a drop in the Conservative lead over the Liberals. The most notable result in this survey is the 4-point Grit lead in Ontario, which contrasts with the 10.8% Tory lead there in the latest Nanos poll. It's not all good news for the Liberals though: their 15.1% in MB/SK is very low, and (according to EKOS methodology) they have fallen 1.1% behind the Greens in BC. The average national Conservative lead is 6.5%. This month's Nanos poll shows a rather standard national Tory-Grit gap. However, many other numbers in this poll raise eyebrows: the NDP got 20.7% nationally, while the Conservative lead over the Liberals in Ontario is a huge 10.8%. The latter, if borne out, would be a disaster for the Liberals. On the other hand, Nanos has the Grits at 30.1% on the Prairies, much higher than the ~20% shown by most other pollsters. However, there is a handful of very close seats in Ontario that would turn blue with another strong Tory poll there. The average Conservative national lead is 7.0%. This week's EKOS poll breaks with the two previous weeks': relative to last week, the Tories have dropped in every region of the country except BC. The most dramatic change is in Ontario, where EKOS now has the Grits and Tories tied again. MB/SK was also very weak (relatively speaking) for the Tories in this poll - but EKOS is normally not charitable to them in this region anyway. This was also a good poll for the NDP (up 1% nationally) and the Bloc (up 3.3% in Québec). The average Conservative national lead drops to 7.1%. ThreeHundredEight.com has reported on a new poll released by Environics. For the Tories, this is a solid poll in all parts of the country save for Atlantic Canada, where they trail the Liberals by 20. The Grits also scored decently in AB and BC, but have low numbers in crucial Central Canada. The Bloc should be happy with this poll, while the NDP's numbers disappoint across the board. The average national Conservative lead is 7.6%.